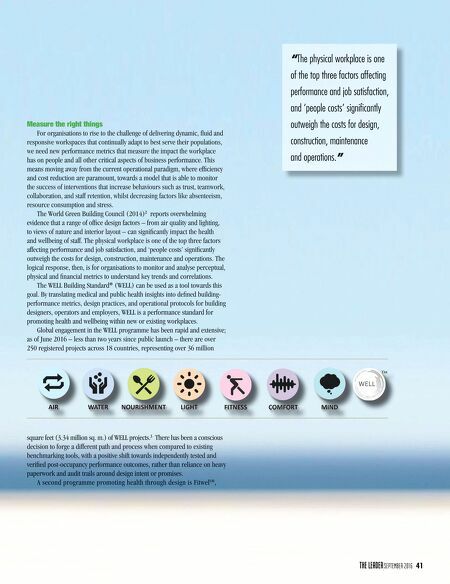 SEPTEMBER 2016 41 Measure the right things For organisations to rise to the challenge of delivering dynamic, fl uid and For organisations to rise to the challenge of delivering dynamic, fl uid and For organisations to rise to the challenge of delivering dynamic, fl uid and responsive workspaces that continually adapt to best serve their populations, responsive workspaces that continually adapt to best serve their populations, responsive workspaces that continually adapt to best serve their populations, we need new performance metrics that measure the impact the workplace has on people and all other critical aspects of business performance. This has on people and all other critical aspects of business performance. This means moving away from the current operational paradigm, where effi ciency and cost reduction are paramount, towards a model that is able to monitor the success of interventions that increase behaviours such as trust, teamwork, the success of interventions that increase behaviours such as trust, teamwork, collaboration, and staff retention, whilst decreasing factors like absenteeism, collaboration, and staff retention, whilst decreasing factors like absenteeism, collaboration, and staff retention, whilst decreasing factors like absenteeism, collaboration, and staff retention, whilst decreasing factors like absenteeism, resource consumption and stress. The World Green Building Council (2014) 2 reports overwhelming reports overwhelming evidence that a range of offi ce design factors – from air quality and lighting, evidence that a range of offi ce design factors – from air quality and lighting, evidence that a range of offi ce design factors – from air quality and lighting, evidence that a range of offi ce design factors – from air quality and lighting, to views of nature and interior layout – can signifi cantly impact the health and wellbeing of staff. The physical workplace is one of the top three factors and wellbeing of staff. 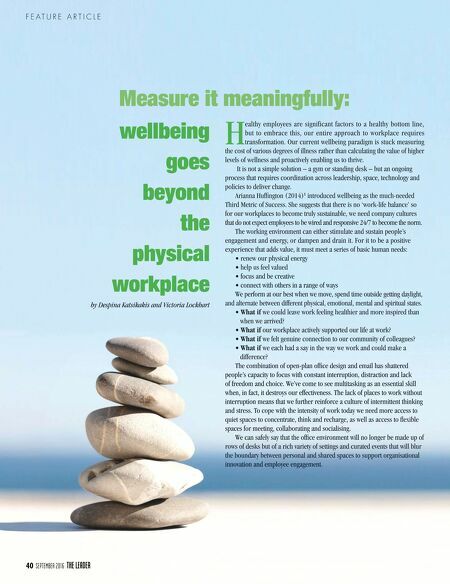 The physical workplace is one of the top three factors and wellbeing of staff. The physical workplace is one of the top three factors affecting performance and job satisfaction, and 'people costs' signifi cantly affecting performance and job satisfaction, and 'people costs' signifi cantly outweigh the costs for design, construction, maintenance and operations. The outweigh the costs for design, construction, maintenance and operations. The logical response, then, is for organisations to monitor and analyse perceptual, physical and fi nancial metrics to understand key trends and correlations. The WELL Building Standard The WELL Building Standard ® (WELL) can be used as a tool towards this (WELL) can be used as a tool towards this goal. By translating medical and public health insights into defi ned building- goal. By translating medical and public health insights into defi ned building- performance metrics, design practices, and operational protocols for building designers, operators and employers, WELL is a performance standard for designers, operators and employers, WELL is a performance standard for promoting health and wellbeing within new or existing workplaces. promoting health and wellbeing within new or existing workplaces. promoting health and wellbeing within new or existing workplaces. Global engagement in the WELL programme has been rapid and extensive; Global engagement in the WELL programme has been rapid and extensive; as of June 2016 – less than two years since public launch – there are over as of June 2016 – less than two years since public launch – there are over as of June 2016 – less than two years since public launch – there are over 250 registered projects across 18 countries, representing over 36 million 250 registered projects across 18 countries, representing over 36 million 250 registered projects across 18 countries, representing over 36 million square feet (3.34 million sq. m.) of WELL projects. square feet (3.34 million sq. m.) of WELL projects. square feet (3.34 million sq. m.) of WELL projects. square feet (3.34 million sq. m.) of WELL projects. square feet (3.34 million sq. m.) of WELL projects. square feet (3.34 million sq. m.) of WELL projects. 3 There has been a conscious There has been a conscious decision to forge a different path and process when compared to existing decision to forge a different path and process when compared to existing decision to forge a different path and process when compared to existing benchmarking tools, with a positive shift towards independently tested and benchmarking tools, with a positive shift towards independently tested and benchmarking tools, with a positive shift towards independently tested and verifi ed post-occupancy performance outcomes, rather than reliance on heavy verifi ed post-occupancy performance outcomes, rather than reliance on heavy verifi ed post-occupancy performance outcomes, rather than reliance on heavy paperwork and audit trails around design intent or promises. paperwork and audit trails around design intent or promises. A second programme promoting health through design is Fitwel SM , "The physical workplace is one "The physical workplace is one of the top three factors affecting performance and job satisfaction, and 'people costs' signifi cantly outweigh the costs for design, outweigh the costs for design, construction, maintenance and operations."